Happy "Fourth of July" Weekend! God bless America and all of you... on this "Fourth of July" Holiday Weekend!! I thought I would share some of the Patriotic Programs that will be on TV this weekend- if you are home or, if you want to record them! Patriotic Movie & Marathon on Gospel Music Channel - Goodbye, Miss 4th of July (Movie) and The Waltons Patriotic Episodes all day on the 4th! Patriotic Programs and Country Videos in honor of our Military- GAC and CMT, on July 4th! *Please see the Family TV Schedule for more details on scheduling times! I pray you all have a safe and very Happy 4th of July! 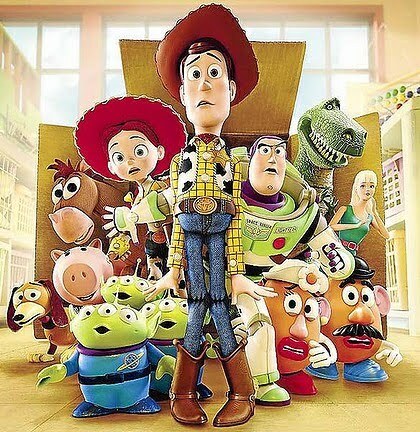 Toy Story 4 is in the Works!!!! According to Tom Hanks who voices Woody, in Toy Story, - when asked by BBC’s Tim Muffet if Disney/Pixar was working on a “Toy Story 4,” he answered: "I think there will be, yeah. Yeah, yeah, think they’re working on it now. There you go..."
I personally, as a very girly girl, who loved her Barbie dolls growing up... Loved the edition of Barbie and Ken. However, I do wish Ken could have been more of a man's man. That's how I think of Ken. I know Barbie was in the other movies, but she took on a bigger role this time around. And then, there's the ending of Toy Story 3... when Andy gives away his most beloved toys, including Buzz, Woody, Jessie, and others... well, like most children and adults who viewed this, I thought it was sweet, yet, somewhat sad. I know Andy has a younger sister - I just don't understand why he couldn't finally give them to her to play with them. Or, he could have kept them for his own children, someday. It will be interesting to see where this movie leads our most beloved characters. I love Tim Allen's portrayel of Buzz Lightyear. Woody, however, is my favorite character, and I would love for him to re-unite with Little Bo Peep! PLEASE NOTE: Please read my WARNING regarding this Movie, below, under Movie Review. Amber Pollock (Cassie Scerbo) is the queen bee of Patrick Boone High School, and the only thing missing to her reign is the Prom Queen title. Having worked for years towards obtaining the crown and most popular girl status, Amber lets nothing and no one stand in her way. That bad behavior comes back to literally haunt her when a freak accident at Prom ends Amber's short, nearly-perfect life and, facing an unpleasant after-life, she is given the task that could save her soul - to get the school's least popular girl to be voted Prom Queen. Amber is sure her future is sunk when she learns her charge is none other than Lisa Sommers (Lindsey Shaw), a shy girl who makes claymation films with her three best friends and whose fashion sense is not up to Amber's standards. As for Lisa herself, the last thing she wants is to be Prom Queen, but when Amber offers to help her get the attention of her crush, Nick, Lisa gives Amber the benefit of the doubt. Will a head-to-toe makeover and some confidence-building advice really be able to turn a shy and awkward teen into a high school social power player? Only Heaven knows! I haven't seen this movie, but it looks pretty much like any another Mean Girls copycat sort of movie. I'm sorry, but... Been there, seen that. And, from reading the plot description (above) the movie sounds like it will be sac religious. As a Christian, I believe accepting Jesus into our hearts, and asking forgiveness for our sins, is the way we all will enter into heaven. In this movie, a young girl named Amber dies, and in order to save her soul, she must help a non-popular girl become prom queen. Oh, that sounds like a truly noble goal. NOT! I personally will not be watching this movie. Nor will I ever recommend it. I am including it on my site - merely as a caution & warning for TV viewers. This movie sends the completely wrong message to teenagers regarding the preciousness of life, reality, and spirituality. Poll Results - Who is your Favorite TV / Movie Father? Thank you to everyone who voted in this Poll. Charles Ingalls was voted as Favorite TV Father, with John Walton, a close second, then Andy Taylor, third. I love both Charles and John, so I'd definitely choose both of them. In fact, I must say... my own Father has often been compared to both of these characters - hard working and caring. God bless all Fathers, who love and care for their children! Ahhh, Summertime! I love it.... the Sunshine, Long days, Lightning Bugs, Outdoor Games, Picnics, and so much more! It is officially Summer Now ~ as of Tuesday, June 21st! I do hope you all had a very nice Fathers Day. Mine was wonderfully spent with all of my precious family and I feel so blessed to have done so! By the way, the Favorite Father on TV or in Movies Poll is still open until early Monday (June 27)- so be sure to vote for your favorites, if you haven't already. The competition continues between Charles Ingalls and John Walton for #1! I also wanted you to know, even though it is summer and many of us are busy with activities or just relaxing... well, I'm still updating various aspects of the site; such as: The Family TV Schedule, New Movies, and Movie Reviews. It's my hope to keep the site "fresh and new" and I hope you enjoy it throughout your Summer Vacation!! New Hallmark Channel Father Movie premieres Fathers Day Weekend! Rock the House is the newest Hallmark Channel Movie and it will premiere this weekend ~ Saturday, June 18th and Sunday, June 19th (which is Fathers Day)! The Movie just so happens to be about the relationship between a Father and Daughter! See the Rock the House Page for more Photos + Details. See the Family TV Schedule for movie times and more Fathers Day Movies & Specials! Fathers Day Movies for your Family! I have put together a list of over 50 Movies - that are great about Fathers! All these Movies have one thing in common... strong Father Roles. Hopefully you'll find one that will inspire you. Please leave a comment below if there is one you especially like or any movie you would like to suggest. Daddy's little girl is expecting a baby... and guess what, Surprise! ... her Father & Mother are expecting, too! This is a great Family Comedy! A terrific old-fashioned movie about a family and respecting one's father. A beautiful story of a single man who takes upon raising 5 children as his own! The original movie starring Spencer Tracy as the worried Father and Elizabeth Taylor, as the blushing bride. Sequel to the original Father of the Bride. George Bailey is a a wonderful father. Plus, he has taken over his fathers business and is dealing with walking in his shoes. Matthew Cuthbert becomes the father Anne Shirley never had. A fun wedding comedy that is a lot like Father of the Bride, except Daddy isn't just giving away one daughter.... this time it's three! The Original fun family comedy! I love Steve Martin in this re-make comedy, too! He's portrays a great Father, even when he messes everything up! This time the family is on vacation - and the Father has a hard keeping up with everyone. Although it's rated PG, I think it should be PG-13. It's quite interesting what Father does when he tries to be Mom! "Build it, and they will come!" A great father - son baseball movie. I love the scene where they play catch! Two cute movies about Three Grown Single Men trying to raise a Little Girl. Captain Von Trapp falls for his childrens' Governess. Sweet Movie about a Father & Daughter. Emma's Father is always a little over-protective of his daughter. Elizabeth Bennett is very close to her father, who has no sons. This Father will do anything to spend time with his children. Disney Family Films trap... their Father and Mother back together! Daddy Warbucks loves Annie as his own. Pop the Popcorn and enjoy!!! I hope many of you, can share these movies with your Daddy! Or, perhaps, these movies bring back special memories. I am so blessed to have a wonderful father, who I love very much! Which Movies, above, do you like about Fathers? Any more suggestions?